2014 December | Federation of North-American Explorers | Semper Parati! Welcome our new FNE National Religious Advisor! The Federation of North-American Explorers is pleased to announce the Fr. Piotr Narkeiwicz of our Polish FSE association has agreed to join us as our FNE national religious advisor. As our new FNE board will be meeting soon to continue to develop the future of our movement in North-America, we are grateful for our religious advisors, who care for the souls of the children of our movement, as well as the leaders who give their time to build it and make it possible. Fr. 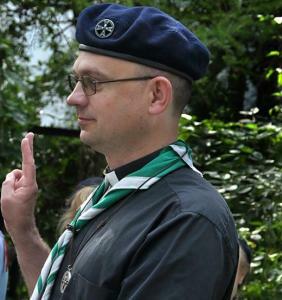 Narkeiwicz has cared for the souls of many Guides and Explorers in Europe, including at Eurojam this past summer, and was most recently present at a joint camp between the 1st North Star and 1st Our Lady of the Annunciation FNE groups. Please remember Fr. Narkeiwicz in your prayers that he may be a good shepherd for us, and also for our leaders that Our Lord may continue to protect us and guide us in our efforts. Welcome Father Piotr, and Semper Parati! My name is Father Piotr Narkiewicz. I am a Polish priest and in my language Piotr means “Peter”. Before I entered the seminary I was a history teacher in high school in Poland. In 2000 I entered the Archdiocesan Missionary Seminary “Redemptoris Mater” in Warsaw. I was ordained 2008 in Warsaw, and since 2012 I have been in Riverhead, NY. After my ordination, I had served for 4 years in parish in Warsaw. There I met the FSE. There were 3 troops of Girl Explorers. In the beginning I only knew that they existed and that they had some meetings in our parish. Sometimes I saw them in the church in uniforms and with the flag, sometimes they did some service during mass like readings, psalms, songs etc. How did I come to be involved with the FSE? There are two parallel stories, but actually it is really just one, the story that God made. In April 2010 our parish was in mourning because our former pastor died in a plane crash. We expected there would be hundreds of people at his funeral, therefore I asked the girl Explorer leader if they could help us to keep everything in order, like guiding people how to enter to the church, line up the people to the communion lines, etc., and they did an excellent job. So I was in contact with them. Then they invited me to summer camp to celebrate the Eucharist for them, so I went. And even though I was there only 2-3 days I was touched so much by their behavior, order, how they build the camp, how they cook, and how they play, that little by little I started to serve them more frequently. Then they invited me to give a blessing during ceremonies, to help prepare prayers, and to help them to prepare a Gospel for meetings. And so it began. So what is the other part of this story? I learned about it two years after I started to work with the FSE. 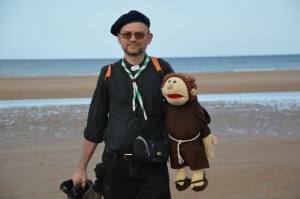 There was a bivouac of all girl Explorers in Poland, and during the homily, a priest who was a girls’ Explorer religious adviser said: “one day one den leader came to me and asked: Father, we do not have a priest for the summer camp. What can we do? And I said: pray! Make a novena to the Virgin Mary. And they started to pray, and one of these priests is here with us now.” And he looked at me. I was completely astonished. Then the girls told me: yes, it was exactly like he said, that God sent you to us, Father! Immediately! This is something, right? So I started to be involved in it. I liked it. I’ve never been an Explorer before, but now I enjoy it! Then I participated in a winter camp doing not only a Mass but also enjoying whole so called “Camp-life”: snow, wind, joy, everything. So I became official a chaplain of a Group in Warsaw. I received a scarf and the chaplain cross. It was a very special moment for me. I really felt that it was something very important, not only for them, that they can have a priest who is close to them, who knows what they do, who knows their problems and everything, but it was also important for me as a priest, that I am part of them not only a priest from outside who is visiting them from time to time to “do his job”. I worked with the troop leader preparing the spiritual program for whole year, also for summer and winter camps (I was 3 times on summer camp and 2 times on winter camp in total). And on July 1st 2012 I made my Explorer promise. At this moment I belong to the big Explorer family. For bad and for good. Last summer I also participated in Eurojam in Normandy. It was a beautiful event for me, to meet so many people from different countries, different cultures and different traditions but with one spirit! So, in 2012 I was appointed as a vicar in Riverhead, NY in the Diocese of Rockville Centre on Long Island. And now, I am ready again to serve in FNE in North-America!